I found that one of the most important components of being a successful gardener is to do each task at the right time. For this reason, most gardeners keep some sort of journal that they can look back on from time to time. Thomas Jefferson who was not only one of our first presidents but also a renowned gardener and meticulous record keeper. My garden records are sloppy to non- existent in comparison. I like to keep all my notes for the month on one sheet of paper like this below. I love to check off accomplished tasks - but otherwise, each month is a fairly blank sheet for me to keep notes like varieties, rainfall, harvest - anything I think is noteworthy. 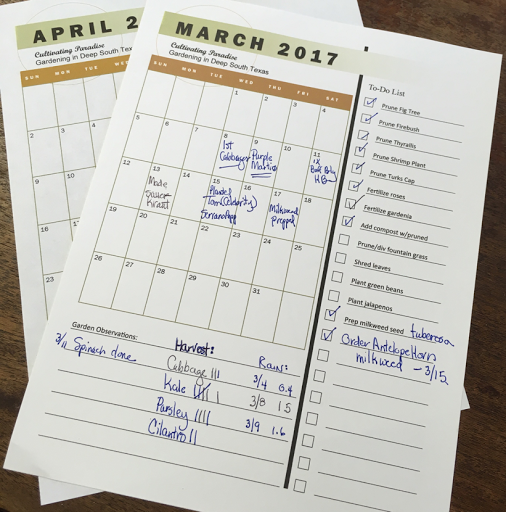 Here are downloadable printable calendars for March and April. Check back and I will add a link to a new calendar each month. I hope this helps you as much as it does me! Happy St. Patrick's Day and happy gardening!